Lip cancers are development of abnormal cells that grow out of control and form lesions or tumors on the lips. They are the most common type of oral cancers. These cancers develop in thin, flat cells — called squamous cells — that line the lips, mouth, tongue, cheeks, sinuses, throat, and hard and soft palates. Symptoms of lip cancer include soreness, lumps or pale colored ulcers in the mouth that are usually painless at first but may become painful with disease progression. According to the National Institute of Dental and Craniofacial Research, most cases of oral cancer are linked to tobacco use and heavy alcohol use apart from that sun exposure is also a major risk factor, especially for people who work outdoors since they are more likely to have prolonged sun exposure. Globally increasing awareness is expected to drive the demand for lip cancer treatment during the period of study. Geographically North America dominated global lip cancer market, due to higher awareness amongst its citizens advanced health care infrastructure, and technological advancement. North America was followed by Europe and Asia-Pacific as second and third largest market respectively. Asia Pacific is projected to have fastest growth, owing to rapidly increasing awareness, developing healthcare infrastructure and increasing spending on healthcare in developing nations such as China, and India in this region. This report identifies the global lip cancer market size in for the year 2014-2016, and forecast of the same for year 2021. 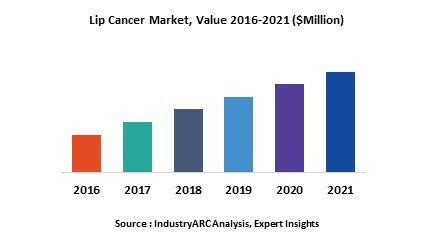 It also highlights the market drivers, restraints, growth indicators, challenges, and other key aspects with respect to global lip cancer market.